Remakes are tricky things, especially when the source material is held in a high regard. Such is the case with the remake of George Romero's 1978 zombie flick Dawn of the Dead. Considered one of horror's all-time classics, the idea of Hollywood remaking Dawn of the Dead really struck a nerve with fans of the original. Why? Remakes aren't always bad. David Cronenberg's remake of The Fly is far better than the original, John Carpenter made a great remake of The Thing From Another World, and the remakes of Invasion of the Body Snatchers (the first remake, anyway) and The Texas Chainsaw Massacre were pretty darn good as well. So how did Zach Snyder's remake of Dawn of the Dead pan out? Read on. Our story begins with Ana (Sarah Polley), who is arriving at her suburban Wisconsin home after a long day of work at the local hospital. She's immediately greeted by Vivian (Hannah Lochner), the young girl who lives next door. Vivian proudly shows Ana a new trick she learned with her roller skates, and Ana heads inside to her husband Luis (Justin Louis). They two have an intimate evening, completely missing an urgent special report on TV. The next morning at dawn, Ana and Luis awaken to find a blood-soaked Vivian at their bedroom door. When Luis attempts to check on her, we discover that Vivian is no longer the cute little girl we saw earlier. Turns out she's now a blood-thirsty zombie! She takes a hunk out of Luis's neck, which ends up killing and resurrecting him as a zombie as well. The freaked-out Ana leaps out the bathroom window and dashes for her car, but she discovers that something foul is afoot in suburbia. The chaos in her house has been multiplied by a million for the rest of the neighborhood, as zombies slowly start to take out their neighbors. Ana gets into her car and drives off with no real destination, but when a carjacker tries to pull her out of the car, she loses control and goes right into a tree. As the opening credits roll, we discover that the zombie attacks have become a worldwide epidemic, and nobody knows just how or why it happened. What we assume is a few hours later, Ana wakes up and crawls out of her car, only to get a shotgun barrel pointed right into her face. The shotgun belongs to Kenneth (Ving Rhames), a local cop. She convinces him that she's still human, and Kenneth decides to bring her along with him. The pair soon runs into three more survivors: Best Buy employee Michael (Jake Weber), gangbanger Andre (Mekhi Phifer), and Andre's very pregnant Russian girlfriend Luda (Inna Korobkina). The five band together and head for the nearest shelter, a gigantic shopping mall. They're soon confronted by C.J. (Michael Kelly), Terry (Kevin Zegers), and Bart (Michael Barry), a trio of mall security guards who've claimed the place for their own. The guards don't trust their new visitors, but decide to let them stay. The group heads to the roof to see what they're up against, and discover Andy (Bruce Bohne), the proprietor of the gun shop across the street, who communicates with those at the mall via a dry-erase board. The next day, the mall group expands by seven when a truck full of survivors arrives at the mall's loading dock. Joining our group are the sarcastic Steve (Ty Burrell), Frank (Matt Frewer) and his daughter Nicole (Lindy Booth), the gorgeous model Monica (Kim Poirier), truck driver Norma (Jayne Eastwood), gay church organist Glen (R.D. Reid), and a sick fat woman whose name we never learn (Ermes Blarasin). As the group thins out, those remaining inside the mall decide they need to escape if they plan on survival. But with the mob of zombies outside growing into the thousands, how will they? Having seen both the original and the remake, I can't help but compare them. 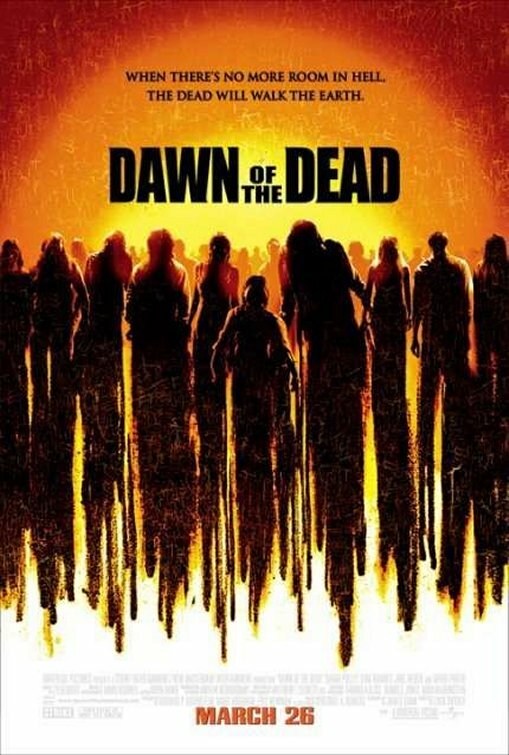 The original Dawn of the Dead serves as a satirical jab at consumerism, while the remake is just about a group of people in a mall surrounded by an army of zombies. George Romero used Dawn '78 to find resemblences in mindless zombies and mall shoppers, but the mall in Dawn '04 is simply a neat place for some zombie action. The remake is certainly more polished and better looking than the original, yet it has less to say when taken for deeper than face value. There's also a big difference in the zombies seen in Dawn '78 and their counterparts in Dawn '04. The zombies in Dawn '78 are covered in blue-gray greasepaint, and stumble around like sleepwalkers. Their 2004 brethren are very different. It's like the zombie legion saw 28 Days Later and decided to do that, but forgot the "zombies" in 28 Days Later were still living people that were infected with a "rage" virus. While running zombies are much more exciting and scary, we have to forget about that whole thing about death. Usually, corpses have to worry about things like rigor mortis, but not these zombies. I guess being a zombie means rigor mortis is no problem. The large cast was also a problem. Movies like Dawn '78 and 28 Days Later benefited from having only a handful of characters to follow. Yet with Dawn '04, the cast expands to the point where we just don't care about most of them (especially Kim Poirier's character, who barely has any screen time at all). Many of the characters might as well have "zombie food" stamped on their foreheads. However, we do have interest in some of the characters. While the subplot of Luda's pregnancy isn't properly fleshed out, it does give us a reason to care about her and Andre. And even though what looks to be a budding romance between Ana and Michael is a dumb subplot (if a gang of undead cannibals just ate your families and they're waiting outside to eat you, would you be playing the field? ), it allows us to care about both characters. We even grow to enjoy the medium-distance friendship between Kenneth and Andy. Another problem I have with Dawn '04 is how goofy some things in the flick are. One of the three security guards spends a lot of the movie doing his best impersonation of Captain Rhodes from Day of the Dead. He spends his time barking orders and waving his gun around, but by the end of the movie, he's one of the good guys. No explanation given, he just goes from being a jerk to being everybody's friend. I was also disappointed with the final payoff of the pregnancy subplot. It had the chance to be the creepiest, most unsettling part of the movie, but just before it got good, it's over. And let's not forget the idiot girl who jeopardizes everything because the stray dog she found the day before ran across the street. However, not everything about the movie is bad. Ty Burrell and Ving Rhames are both great, while Sarah Polley did a good job with what she was given, and Mekhi Phifer turned in a good performance and gave his role some needed depth, despite his limited screen time. Director Zach Snyder did a great job behind the camera, and while his wild camera moves during action scenes could have gotten nauseating after so much, it proved to be effective. I also really enjoyed the scenes spliced into the end credits, which gave us a kind-of epilogue to the movie. The score by Tyler Bates is really fitting in its gloominess, and the music selections are out of this world. Two versions of "Down With The Sickness" (Disturbed's version and a "lounge" cover by Richard Cheese), the Johnny Cash song mentioned earlier, and Jim Carroll's punk-ish "People Who Died" make the non-score soundtrack a lot of fun. I also really enjoyed the cameos from Dawn '78 cast members, with Tom Savini as a sheriff, Scott Reiniger as a soldier, and Ken Foree as a televangelist who reprises Dawn '78's most memorable line (which is also the tagline for both movies). I also got a chuckle out of the clothing store named "Gaylen Ross," an obvious reference to the original Dawn's lead actress. Overall, I'll give the Dawn of the Dead remake three and a half stars. Even though it was lacking in some places, I'm pleased with the effort.